The Swiss franc is the official currency of Switzerland, Lichtenstein, and the Italian exclave Campione d’Italia. It is one of the eight currencies to be considered a ‘major’ currency alongside the US Dollar, Euro, Pound Sterling, Canadian Dollar, Australian Dollar, New Zealand Dollar, and Japanese Yen. Up until the introduction of the euro in 1999, there were several different versions of the franc used in France, Belgium, Luxembourg, Andorra, and Monaco, as well as in the former French colonies of Algeria and Cambodia. The term franc was first used to describe a French gold coin minted in 1360, weighing in at 3.87g, and was later used to describe a silver coin that was issued between 1575 and 1641, when it was abolished by Louis VIII. However, the name stuck around and was used to describe another coin called the livre tourmois. In 1795, it finally became the main currency of France, and remained so until the introduction of the euro in 1999. France’s conquest of much of Western Europe during the Revolutionary and Napoleonic eras led many countries to accept the franc as legal tender. Belgium was the first to mint its own version of the franc in 1832 after winning independence from the Kingdom of the Netherlands, and Luxembourg and Switzerland followed suit in 1848 and 1850 respectively. Italy implemented the lira as a franc equivalent in 1862, and three years later France, Switzerland, Belgium, and Italy formed the Latin Monetary Union, with Spain and Greece joining in 1868. This established the value of each currency as being worth 4.5g of silver or 0.290322g of gold, although the silver standard was dropped two years later, and they were all exchangeable on a 1:1 basis. The franc is still used throughout a wide range of former French colonies in Africa, and there are now several distinct varieties in use across the continent, with the Central African CFA franc and the West African CFA franc being the most common. With the introduction of the euro in 1999, the Swiss franc became the only remaining version of the currency in use in Europe. Shortly after France, Belgium, and Luxembourg switched to the single currency, the Swiss franc began to appreciate significantly against the euro, with the biggest surge coming between April and September 2000. Traditionally, the Swiss franc has been seen as a safe-haven currency in turbulent economic times, drawing strength from virtually zero inflation and a legal requirement that it be backed by gold reserves to at least 40% of its value. This link to gold was stopped in 2000 following a referendum, and by March 2005 gold accounted for just 20% of the Swiss National Bank’s assets following a gold selling programme. Despite dropping the gold backing, the Swiss Franc continued to be seen as a safe-haven currency – and turbulent times were indeed on the way. Throughout the first decade of the 2000s, the Swiss franc had been steadily appreciating against the dollar, but when the Eurozone crisis hit in 2011, things went a little haywire. Fearful that government debt in Greece and a few other countries in the Eurozone were going to bring down the euro, investors flocked to the Swiss franc, and its value began to skyrocket. 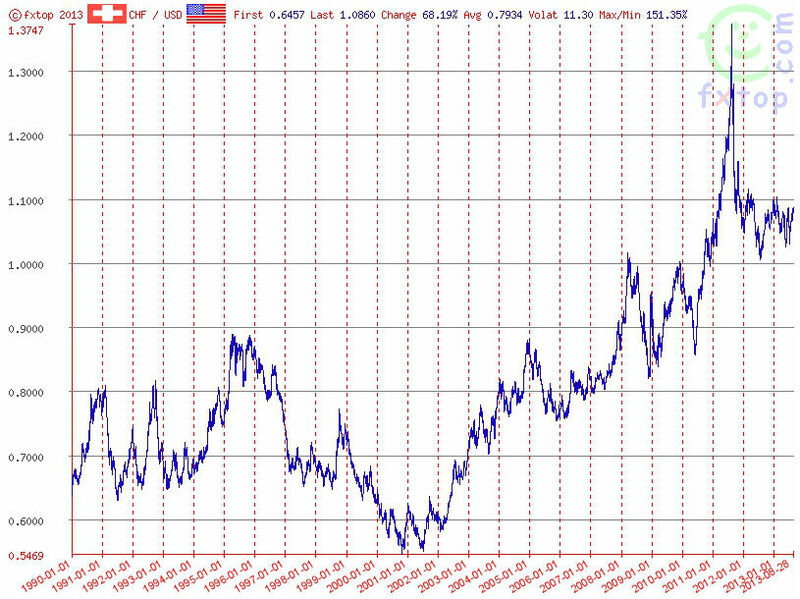 By March, it had already risen past US$1.10. It then went on to hit $1.20 in June and $1.30 in August, and this was starting to have a very negative effect on the Swiss economy. In July of that year, the Economist used its Big Mac Index to argue that the Swiss franc was overvalued to the tune of 98% against the dollar, and the strength of the franc was causing Swiss companies to issue profit warnings and threaten to move operations out of the country. Such was the demand for francs that Swiss interest rates effectively became negative. In an effort to stem the raging demand for the franc, the Swiss National Bank set a minimum exchange rate of 1.20 francs to the euro, and said that it was “prepared to buy foreign currency in unlimited quantities”. This move stunned the forex world, and effectively ended the franc’s status as a safe haven currency. On the day of the announcement, the franc fell 9.5% against the dollar and 8.8% against the euro, and apart from one instance of the franc breaking the SNB’s self-imposed ceiling in April 2012, it has continued to trade below the target level to this day.